2. 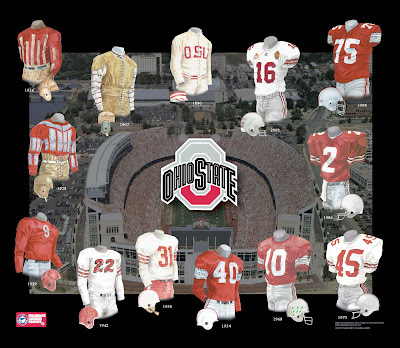 Please note that all of the actual original, one-of-a-kind artwork of the Ohio State University football uniforms as seen in the poster above are actually available for sale. These watercolor paintings are truly beautiful, original watercolor paintings, and there are only 14 of them so please act quickly if you would like to buy one. 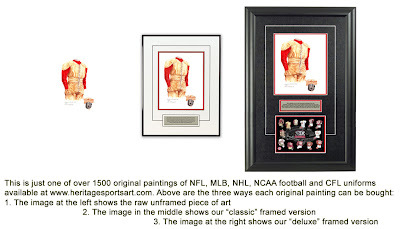 These would make a wonderfully memorable, beautiful and completely unique gift for someone who loves Ohio State football. If you would like more information about this great artwork including the three ways you could purchase each piece, please visit our Ohio State YouTube video at www.youtube.com/watch?v=2L8-XLhduJU or go directly to the artwork website www.heritagesportsart.com/Ohio-State-Buckeyes-c89/ where you can see and purchase the artwork. Ohio State University, a state-related land-grant university, is a coeducational, public research university. Founded in 1870 and located in Columbus, Ohio, it is regarded as one of the largest universities in the United States. The football team played its first season of ball in 1890. The Buckeyes football team plays out of Ohio Stadium, which was built in 1922 and seats 101,568 spectators. Ohio State boasts an excellent tradition of football success; countless Buckeyes have extended their football careers in the NFL, Arena League and the CFL. 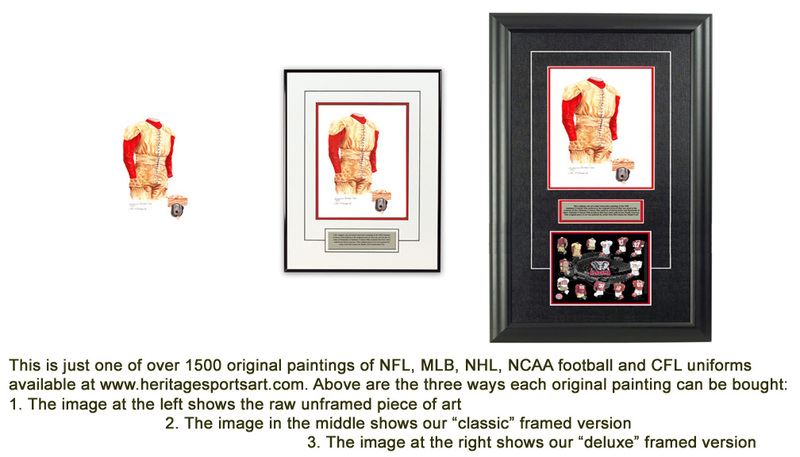 Notable Buckeyes alumni include: "Chic" Harley, Don Scott, Les Horvath, Archie Griffin and Orlando Pace. If Ohio State was nationally ranked in "The Top 20" (or Top 10 in some years) in a particular season depicted in the poster, we show the team’s ranking. That being said, prior to 1936 there was no nationally recognized poll ranking the nation’s top teams, so you will not see any rankings prior to 1936. 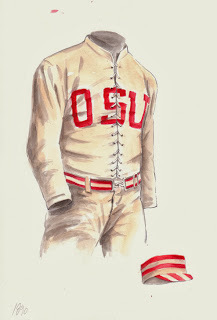 This painting honors the 1907 Ohio State University football team. Coached by Al Herrnstein and captained by Right Tackle H.J. Schory, the 1907 team went 7-2-1, outscoring their opponents 160-49, including 6 shutout victories. 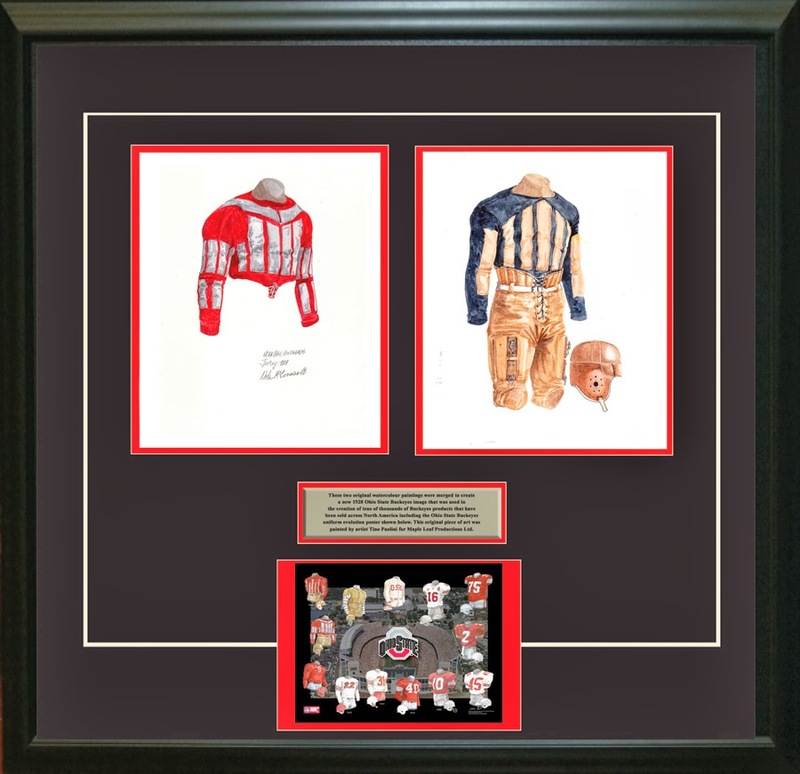 This painting honors the 1916 Ohio State University football team. Coached by John Wilce, captained by Frank Sorensen and featuring All-American Halfback "Chic" Harley, the 1916 team went undefeated at 7-0, including a whopping 128-0 victory over Oberlin. With a 23-3 victory over Northwestern on November 25th, the Buckeyes captured their first Big Ten Conference Championship in front of 11,979 people at Ohio Field. This painting honors the 1928 Ohio State University football team. Coached by John Wilce and captained by Leo Raskowski, the 1928 team went 5-2-1, outscoring opponents 135-35. 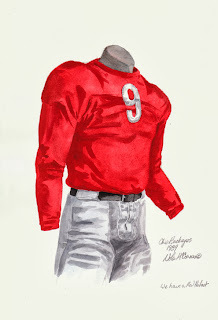 This painting honors the 1939 Ohio State University football team and #9, worn by Don Scott. Coached by Francis Schmidt and captained by Steven Andrako, the 1939 team went 6-2 and finished as Big Ten Conference Champions. All-American in 1939 (and again in 1940). He ‘lettered’ at Ohio State for football 1938-40 inclusive and also was a member of the 1938-39 basketball team that reached the inaugural NCAA tournament’s championship game. In 1941, Don was selected by the Chicago Bears as the draft’s 9th overall pick, but opted instead to serve his country as a pilot in World War II. Tragically, on October 1, 1943, Captain Don Scott was killed when his bomber crashed during training in England. A month later, in his honor, the Ohio State Trustees would nickname the school’s new airport "OSU Don Scott Airport". He is a member of the Ohio State University "O" Hall of Fame. Here is what our friends at Wikipedia have to say about Don Scott. 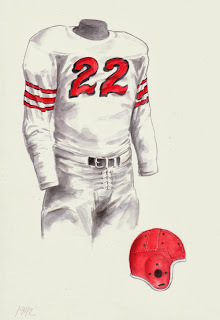 This painting honors the 1942 Ohio State University football team and #22, worn by Leslie "Les" Horvath. Coached by Ohio legend Paul Brown and captained by George Lynn, the 1942 team went 9-1, winning its first National Championship. Les Horvath was both a Halfback and Quarterback for Ohio State University and won college football’s Heisman Trophy in 1944 - awarded to the outstanding intercollegiate football player in the United States. In the 1944 season, Les would also be named the Big Ten Conference MVP and Buckeyes’ football MVP. Following his career at Ohio State, Les served his country as an Ensign in the United States Navy - discharged in 1947. He played for the Los Angeles Rams in the NFL before joining the Cleveland Browns of the All-American Football Conference (AAFC). After his football playing days, having graduated from Ohio State with a degree in Dentistry, Les practiced in the Los Angeles area. He was elected to the College Football Hall of Fame in 1969. He went on to the NFL where he played for 2 seasons, before playing in the AAFC for 1 season. Here is what our friends at Wikipedia have to say about Les Horvath. 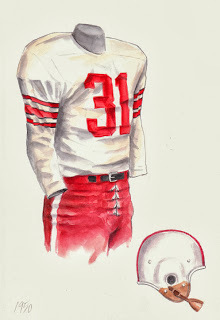 This painting honors the 1950 Ohio State University football team and #31, worn by Victor "Vic" Janowicz. Coached by Wesley Fesler and captained by Henry "Bill" Trautwein, the 1950 team went 6-3. 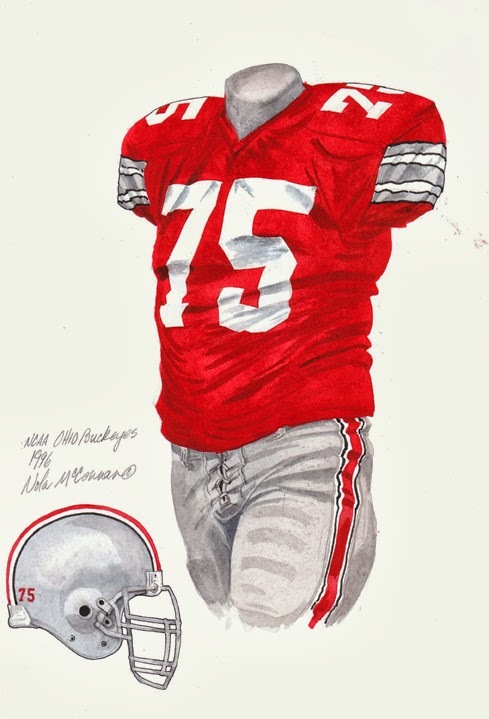 Vic Janowicz was a very versatile football player for Ohio State University - having ran, passed, punted, blocked, and place-kicked at various points of his Buckeye career. In 1950 as a Halfback, Vic was not only voted All-American, but also won college football’s Heisman Trophy - awarded to the outstanding intercollegiate football player in the United States. He would also be named the Big Ten Conference MVP and Buckeyes’ football MVP (again in 1951). Following his career at Ohio State, Vic played professional baseball, appearing in 81 games with the Pittsburgh Pirates from 1953-54, before returning to football late in 1954 with the Washington Redskins. A serious automobile accident in 1956 ended his athletic career and left him partially paralyzed. He was elected to the College Football Hall of Fame in 1976. He went on to the NFL where he played for 2 seasons. Here is what our friends at Wikipedia have to say about Vic Janowicz. 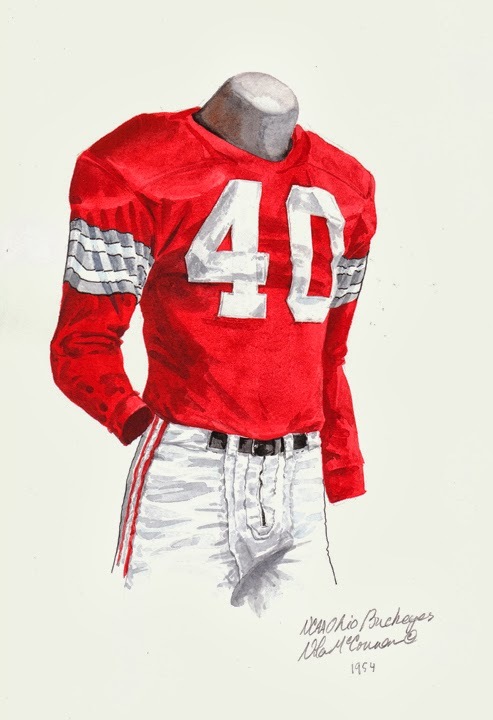 This painting honors the 1954 Ohio State University football team and #40, worn by Howard Cassady. 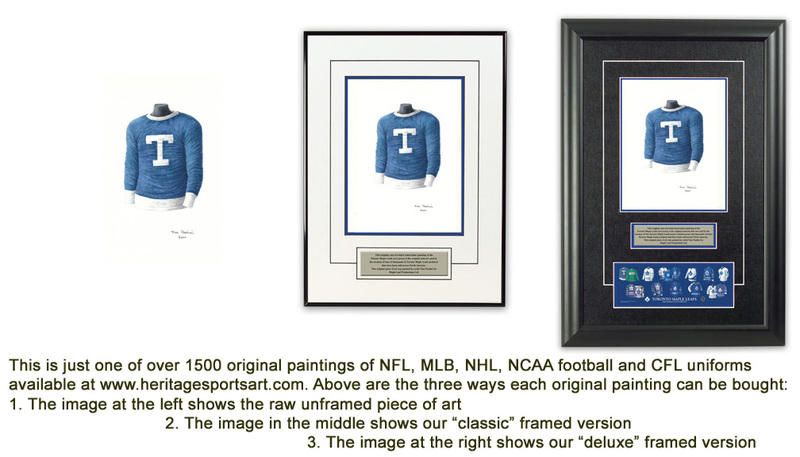 Coached by Buckeye staple Woody Hayes and co-captained by Richard Brubaker and John Borton, the 1954 team went 10-0. Howard Cassady, also known as "Hopalong", was a Halfback for Ohio State University. 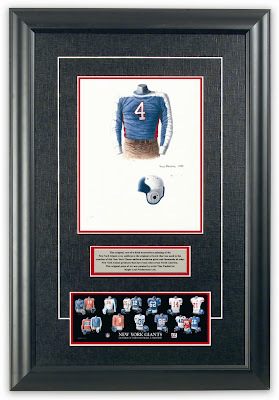 In 1955, Howard was not only voted All-American (for the 2nd time), but also won college football’s Heisman Trophy - awarded to the outstanding intercollegiate football player in the United States. He was also named the Big Ten Conference MVP and selected as Athlete of the Year by the Associated Press. Following his career at Ohio State, Howard played the majority of his professional football career with the Detroit Lions, playing 7 of 8 seasons with them. He would split 1962 between the Cleveland Browns and Philadelphia Eagles, before returning to the Lions for his final NFL season in 1963. He was elected to the College Football Hall of Fame in 1979. He was recognized as the 114th best College Football Player of all time by the College Football News in their 2000-ish ranking. Here is what our friends at Wikipedia have to say about Howard Cassady. 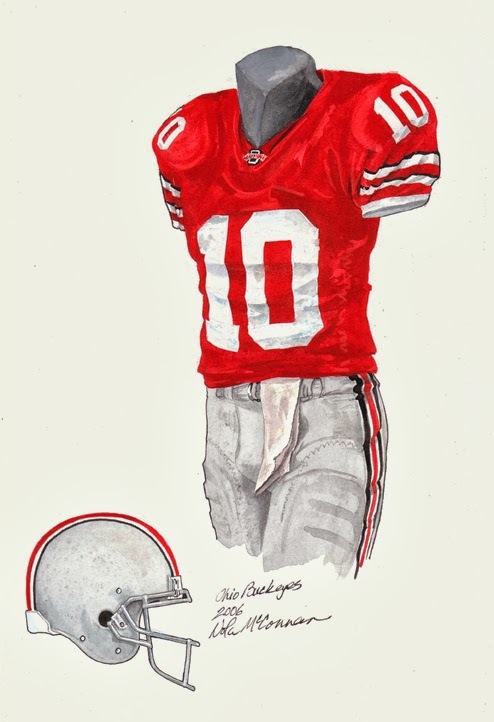 This painting honors the 1968 Ohio State University football team and #10, worn by Rex Kern. Coached by Buckeye staple Woody Hayes and co-captained by David Foley and Dirk Worden, the 1968 team went 10-0. 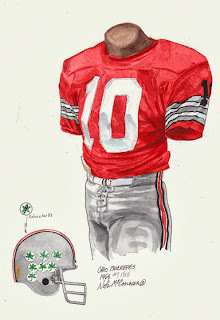 Rex Kern was a Quarterback for Ohio State University. After quickly recovering from back surgery in June 1968, Kern would become the leader of a team dubbed the "Super Sophomores" - due to the fact that 13 sophomores (10 starters) were played by Coach Hayes. The "Super Sophomores" would not only shut out the top-ranked Purdue Boilermakers early in the 1968 season, but would finish the season undefeated, win a Big Ten Conference Championship and would be ultimately crowned as National Champions. In the Buckeyes’ 27-16 Rose Bowl victory against O.J. Simpson and the USC Trojans, Kern was named the Most Outstanding Player. In 1969, Kern would be voted All-American and would finish 3rd in Heisman Trophy balloting (in 1970, he would finish 5th). Following his career at Ohio State, Rex played for the Baltimore Colts and the Buffalo Bills. A recurrence of his back injury impeded his NFL career - forcing him to retire following the 1974 season. He went on to the NFL where he played for 4 seasons. He was elected to the College Football Hall of Fame in 2007. Here is what our friends at Wikipedia have to say about Rex Kern. 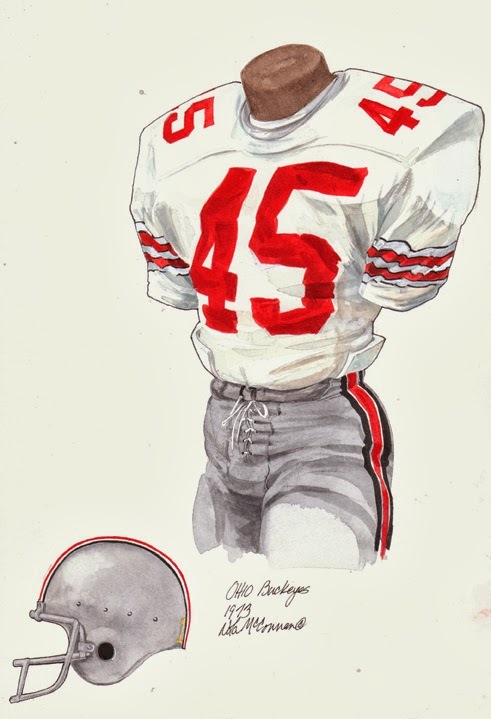 This painting honors the 1973 Ohio State University football team and #45, worn by Archie Griffin. 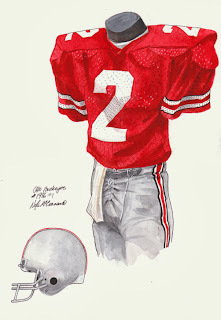 Coached by Buckeye staple Woody Hayes and co-captained by Greg Hare and Richard Middleton, the 1973 team went 10-0-1. Following his career at Ohio State, Archie played for the Cincinnati Bengals in the NFL and briefly in the United States Football League (USFL), before returning to Ohio State as Associate Athletic Director and later as President of the Alumni Association. He was elected to the College Football Hall of Fame in 1986. He was recognized as the 15th best College Football Player of all time by the College Football News in their 2000-ish ranking. He went on to the NFL where he played for 7 seasons. Here is what our friends at Wikipedia have to say about Archie Griffin. 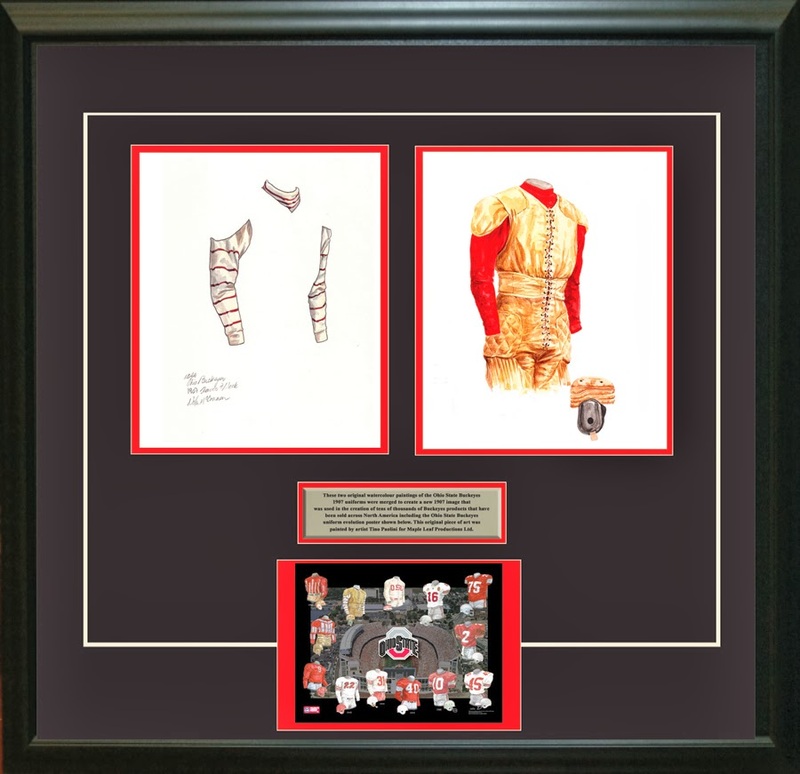 This painting honors the 1986 Ohio State University football team and #2, worn by Cris Carter. Coached by Earle Bruce and co-captained by Jim Karsatos and Sonny Gordon, the 1986 team went 10-3. Cris Carter was a Receiver for Ohio State University. During his Buckeye playing days, he not only set a Rose Bowl record on January 1, 1985 with 9 receptions for 172 yards, but was also voted All-American after his junior year. Throughout his college (and later professional football career), Cris was acknowledged for his great hands, precise routes, great body control and astounding footwork - especially when making catches along the sidelines. Following his career at Ohio State, Cris played for the Philadelphia Eagles before becoming a mainstay in the Minnesota Vikings’ offense. Then-Eagles coach, Buddy Ryan, would be famously quoted as saying "all he does is catch touchdowns" - a quote that would be often referenced by broadcasters (especially famed ESPN commentator Chris Berman) during Carter’s prolific Viking years. Cris concluded his football career with the Miami Dolphins and worked often as an NFL Analyst afterwards. He went on to the NFL where he played for a remarkable 16 seasons. Here is what our friends at Wikipedia have to say about Cris Carter. This painting honors the 1996 Ohio State University football team and #75, worn by Orlando Pace. Coached by John Cooper and co-captained by Juan Porter and Greg Bellisari, the 1996 team went 11-1. It is said that the term ‘Pancake Block’ (when an Offensive Lineman knocks a defender on their back) gained notoriety and popularity in large part because of Pace’s dominating play on the Offensive line. Ohio State’s Athletic Department issued pancake magnets as a promotion to help celebrate Orlando’s 1996 Heisman run. Following his career at Ohio State, Orlando was the first Offensive Lineman since Ron Yary (1968) to be taken #1 overall in the NFL draft - when he was selected by the St. Louis Rams. During his career, he was voted to 7-straight Pro Bowls (dating back to 1999), won a Super Bowl on January 30, 2000 and was regarded as one of the best tackles in the sport - especially noted for his effective pass-protection. He was recognized as the 29th best College Football Player of all time by the College Football News in their 2000-ish ranking. A summary of his 13 year NFL career can be found here. Here is what our friends at Wikipedia have to say about Orlando Pace. This painting honors the 2002 Ohio State University football team and #16, worn by Craig Krenzel. Coached by Jim Tressel, the 2002 team went undefeated at 14-0. Ohio State was crowned National Champions in 2002 and capped off their undefeated season by beating Miami 31-24 in the Tostitos Fiesta Bowl in a double overtime thriller. 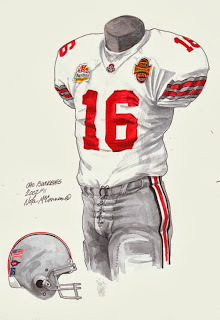 Craig Krenzel was a Quarterback for Ohio State University. In 2002, he shared the Ohio State football MVP award with Chris Gamble. In 2003, Craig was voted the winner of the Draddy Trophy (Vincent dePaul Draddy Trophy) - which is considered by many to be the ‘academic’ Heisman award. It is given to the American college football player with "the best combination of academics, community service and on-field performance". Following his career at Ohio State, Craig was drafted by the Chicago Bears and also played briefly with the Cincinnati Bengals. Following his release from the Bengals in May 2006, Craig went back to Ohio State to become a Commentator for the Buckeyes. Here is what our friends at Wikipedia have to say about Craig Krenzel. The 2006 Ohio State University football team, coached by Jim Tressel, went undefeated during the regular season at 12-0. The team played the University of Florida Gators in the Tostitos Fiesta Bowl on January 8, 2007 and were defeated 41-14. Following his career at Ohio State, Troy was drafted by the Baltimore Ravens. A summary of his four year NFL career can be found here. Here is what our friends at Wikipedia have to say about Troy Smith. 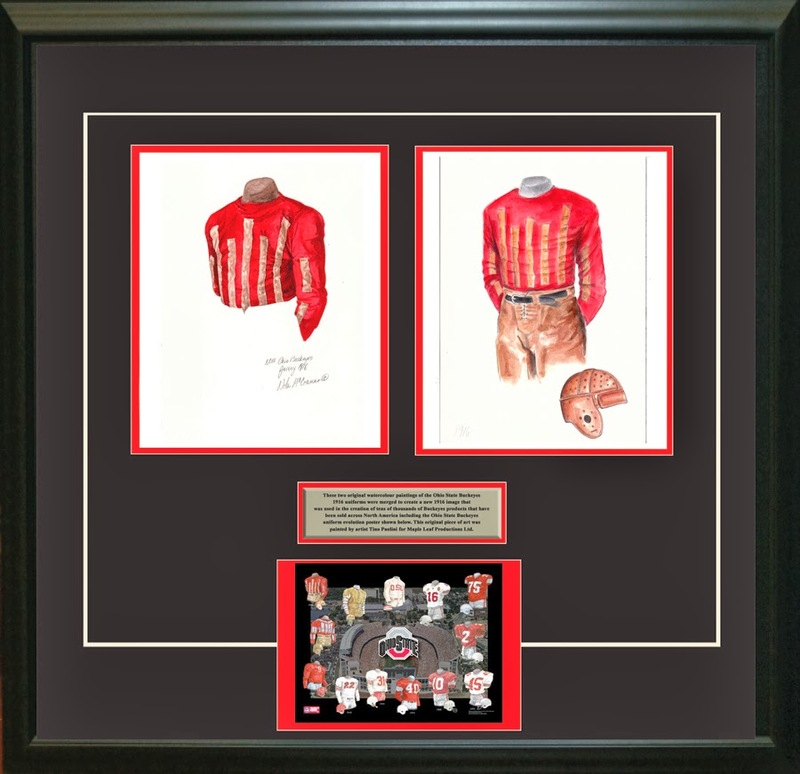 If you love Ohio State and the history of Buckeyes football, you might really love to own an original piece of artwork celebrating the team's historic uniforms as seen in the poster at the top of this blog - you can actually own one of those original pieces of art! There are only 14 pieces of original art available for sale, and when these 14 are sold, that's it, they're all sold out. 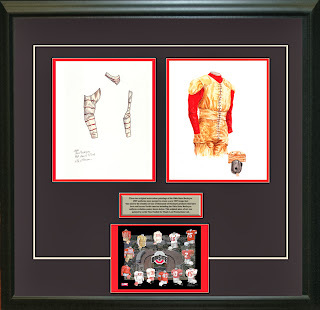 If you would like more information about this great artwork including the three ways you could purchase each piece, please visit our Ohio State Buckeyes YouTube video at www.youtube.com/watch?v=2L8-XLhduJU or go directly to the artwork website www.heritagesportsart.com/Ohio-State-Buckeyes-c89/ where you can see and purchase the artwork.